This summer I spent a few weeks travelling around central and western Canada in an attempt to catch up with some ‘long lost’ members of my family. My grandmother lived on Vancouver Island for many years, emigrating before I was born, and it is a regret that I was never able to visit her before she died. 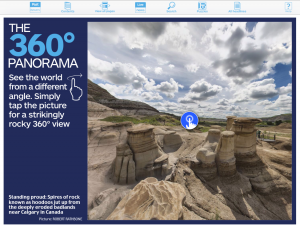 Starting in Calgary we headed north towards Edmonton with a small diversion to the fabulous Drumheller Hoodoos in the Alberta Badlands. This is dinosaur country and the Red Deer River valley is also known as Dinosaur valley. The highway leading through the town passes the World’s largest fibreglass dinosaur, standing 86 feet tall, as you cross the river. Just north of the town you find the Royal Tyrrell Museum of Palaeontology which has to be seen to be believed, it houses a fantastic collection of dinosaur remains. Moving north again via Edmonton we headed for the world’s first UFO landing pad at the town of St Paul. Unfortunately we arrived on the Canada Day public holiday and so all the visitors must have been busy celebrating elsewhere. This incredible concrete structure was built as a centennial project in 1967, at the height of the space race, in an effort to attract both tourists and ‘Martians’ to the town. The pad consists of a raised platform with a map of Canada made from stones provided by each province of Canada and a visitors centre. Next stop was the hamlet of Wabasca. This is within the wonderfully named Municipal District of Opportunity No. 17 and located beside the North and South Wabasca Lakes, approximately 75 miles northeast of Slave Lake. Wabasca has a population of about 3,500 which is largely native Canadian including Indian reserves of the Bigstone Cree Nation and this includes my uncle Bruce and his family. Bruce emigrated from England in the 1940’s and still runs the tyre garage in the town even though he is 80 years old. Over the years he became a well respected member of the community, so much so that they named the fire hall after him in recognition of his years of service. During our stay the travel plans had to be adjusted after a beaver dam caused the main highway to collapse. Luckily uncle Bruce was able to take me to the scene, past a couple of road blocks, to have a close look ! Despite a diversion followed by a long drive along the ‘Grizzly Trail’, where we saw no signs of any wildlife, we were soon heading into Jasper National Park. A stunning cruise through the Rocky Mountains was followed by a trip along the Icefields Parkway towards Banff. The wildlife and scenery were spectacular. Within minutes of entering the national park we saw four elk paddling in the Athabasca River. A river the width of some lakes in England. Brown bears, black bears, deer, mountain goat and eagles appeared regularly as if they were booked to provide the tourists with photo opportunities. 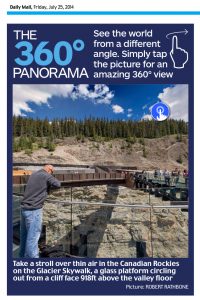 Brewster Travel made sure I had fantastic access to their latest tourist attraction, the newly built Glacier Skywalk. 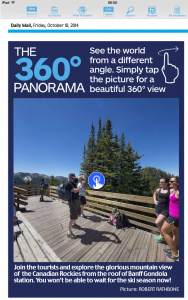 Following a short bus ride from the Columbia Icefield Discovery Centre we reached the glass-floored observation platform 900 feet above the Sunwapta Valley. Visitors walk out beyond the cliff edge for about 100 feet over the valley and Sunwapta River. The stunning views show how the region has been shaped by immense glacial power. Brewster Travel then took us on their Glacier Experience tour. A massive Ice Explorer vehicle specially designed for glacial travel took us to the surface of the Athabasca Glacier in the Columbia Ice Fields. An experienced driver-guide shared a wealth of information about glaciers, icefields and their impact on our environment during the journey. 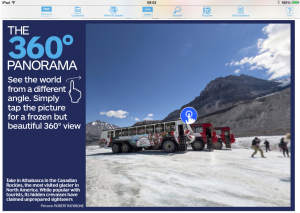 Passengers were allowed to step out onto the glacier and take in the most stunning alpine and glacial vistas and I got chance to shoot a quick 360 degree picture for Mail Plus. Next stop was Banff and a trip up Sulphur Mountain, using Brewster Travel’s Banff Gondola, to see the spectacular panoramic view. The summit ridge provides views both westward up and east down the Bow Valley. There is a superb view of Banff and the world famous Banff Springs Hotel below. There is also a path on the north side of the gondola station to the top of Sanson’s Peak (7,402 ft). But, if you want to be picky, the true summit of Sulphur Mountain can be found on the southern side on a scrambler’s route. Sulphur mountain has been the site of two research facilities. A meteorological observatory building on Sanson Peak still exists and visitors can look through a window to see its interior complete with rustic furnishings. A plaque marks the site of The Sulphur Mountain Cosmic Ray Station, built by the National Research Council to study cosmic rays as part of Canada’s contribution to the International Geophysical Year in 1957. The hot springs at the base of Sulphur Mountain are home to the endangered Banff Springs snail as well as a rather spectacular hotel. The final part of our journey through the Rockies took us past the seasonal forest fires via the Saskatchewan River Crossing, which had to be evacuated the next day. Apparently these fires are standard for a Canadian summer and an occupational hazard for the locals. We arrived in the town of Sparwood, following in the footsteps of another distant relative who had emigrated to British Columbia to work in the mines in the early 1900’s. The local economy is still heavily dependent on coal mining, one of British Columbia’s primary industries. A large part of the population either works in the mines or as tradesmen and labourers in related support industries, such as trucking or as mechanics. 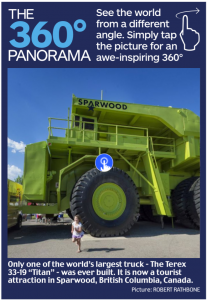 Sparwood also happens to be the home of the world’s largest truck, a Terex 33-19 “Titan”. This was built as a prototype off-highway, ultra class, rigid frame, three-axle, diesel/AC electric power train haul truck. Designed by the Terex Division of General Motors and assembled at their Diesel Division’s London, Ontario assembly plant in 1973. Only one 33-19 was ever produced and it was the largest, highest capacity haul truck in the world for 25 years. After 13 years in service, the 33-19 was restored and is now preserved on static display as a tourist attraction in the centre of the town next to a car park.